Overweight is a body weight that is above an ideal range. Extra weight can increase in the risk of some serious health problems. This includes heart disease, certain cancers, and diabetes. Overweight is caused by taking in more calories than are used. Calories are taken in through food. Physical activity and basic body functions use calories. If more calories are eaten than used, then weight gain will happen. There are many different options to treating obesity. A mix of treatments may be most successful. It should include changes in diet, activity, counseling, or medicine. Your and your doctor will find a plan that works best for you. The key to weight loss is to reduce the total number of calories that you eat. Following a specific kind of diet, like a low-carb diet, is not necessary. It is much more important to choose a low calorie diet that you can stick with. Portion, or serving size, also plays an important role. Learning how to read nutrition labels may help you succeed. Keep track of everything you eat and drink. There are several tracking apps that can be used on your phone or tablet. It makes tracking much easier. Ask your doctor about an exercise program. Even moderate-intensity exercise, like brisk walking, can help you lose weight. There are many easy ways to add extra activity into your day. Take stairs instead of elevators. Park your car a little further away. Limit the amount of time you spend watching television. Decrease computer time and substitute it with activity. There are many tools to help you track and measure your activity. This includes counting the number of steps throughout the day. Many of these tools can connect to apps on your phone or tablets. Get on a regular sleep schedule. Go to bed and get up around the same time every day. Continue even on your days off. Reduce noise, temperature, and light in the bedroom. Avoid caffeine, nicotine, and alcohol before bed. Eat a light dinner and avoid heavy evening meals. Create a relaxing routine before bed. Try taking a warm bath or reading a book. Sleep apnea interferes with sleep. If you snore loudly or stop breathing during the night, talk to your doctor about getting a sleep test. Sleep apnea is treatable and it will improve your overall health. When combined with diet and exercise, therapy can help you with your weight reduction. Weight loss programs may work for some people. A partner or group may also help you improve your eating habits and fitness. Weight loss medicine may be prescribed. Medicine alone is not enough to lose weight and keep it off. Some medicine can have serious side effects. There are also risks associated with over the counter medicine and herbal products. Talk to your doctor before taking any of these. These procedures may be a good option for people who are severely obese. It may also be recommended for people who are having trouble losing weight by other means. This option uses a balloon type tool. This balloon fills up the stomach creating a feeling of fullness. 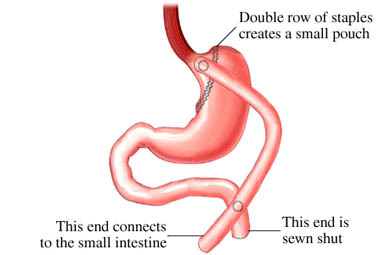 The device is inserted into the mouth and passed to the stomach. The device is removed 6 months after it is placed. Talk to your doctor for more information about this procedure. Talk to your doctor or a dietitian about your daily calorie needs. Learn to eat smaller portions of food. Limit the amount of time you spend doing sedentary activities. This includes watching TV or using the computer. Talk to your doctor or an exercise professional about working activity into your daily life. Body mass index (BMI calculator). American Heart Association website. Available at: http://www.heart.org/HEARTORG/HealthyLiving/WeightManagement/BodyMassIndex/Body-Mass-Index-BMI-Calculator%5FUCM%5F307849%5FArticle.jsp#.WrUYzS7wZQJ. Updated July 12, 2016. Accessed March 23, 2018. Complications of obesity. EBSCO DynaMed website. Available at: http://www.dynamed.com/topics/dmp~AN~T576498/Complications-of-obesity. Updated January 19, 2018. Accessed March 23, 2018. Diets for weight loss. EBSCO DynaMed Plus website. Available at: http://www.dynamed.com/topics/dmp~AN~T316887/Diets-for-weight-loss. Updated January 22, 2018. Accessed March 23, 2018. Dietary guidelines for Americans 2015-2020. US Department of Health and Human Services website. Available at: https://health.gov/dietaryguidelines/2015/guidelines. Accessed March 23, 2018. Obesity. Merck Manual Professional Version website. Available at: https://www.merckmanuals.com/professional/nutritional-disorders/obesity-and-the-metabolic-syndrome/obesity. Updated December 2016. Accessed March 23, 2018. Obesity, bias, and stigmatization. Obesity Society website. Available at: http://www.obesity.org/obesity/resources/facts-about-obesity/bias-stigmatization. Accessed March 23, 2018. Obesity in adults. EBSCO DynaMed website. Available at: http://www.dynamed.com/topics/dmp~AN~T115009/Obesity-in-adults. Updated January 19, 2018. Accessed March 23, 2018. Physical activity for weight loss. EBSCO DynaMed website. Available at: http://www.dynamed.com/topics/dmp~AN~T316888/Physical-activity-for-weight-loss. Updated January 18, 2018. Accessed March 23, 2018. Understanding adult overweight & obesity. National Institute of Diabetes and Digestive and Kidney Diseases website. Available at: https://www.niddk.nih.gov/health-information/weight-management/adult-overweight-obesity. Accessed March 23, 2018.